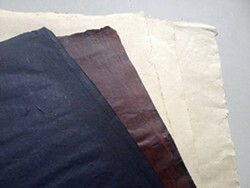 In this class, students will learn about flax fiber and the multitude of ways in which it can be used in papermaking. Traditionally, flax—a bast fiber—is used commercially to produce linen cloth. This incredibly strong and versatile fiber has been used to make paper since the 8th century CE. We will explore its wide range of properties from start to finish and make thick, opaque sheets, suitable for book covers, as well and thin and translucent sheets for printmaking and/or sculptural applications.